The EA Preset files are now included in your "V2_Include_Scripts_Presets" download file located on your "My Account" page. However, you may also download them separately here and follow these installation instructions. To download the new V2 Preset files, you must first log into the website at: http://roulettetrader.com/wp-login.php (Click to open a new tab). 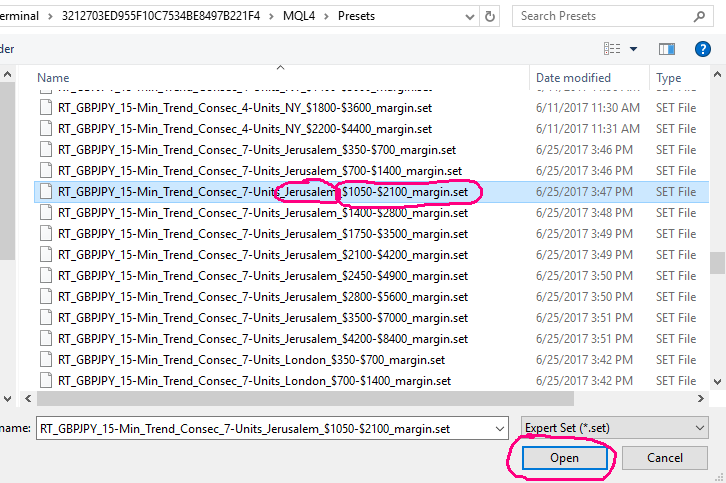 Open the folder matching your chart's time zone and copy the Preset files to your MT4 Presets folder. To reduce unnecessary clutter, only copy the preset files for the EAs and margin you intend to use. You can always add the others later. There's no need to restart MT4. The new Preset files will appear in MT4 immediately. That's it! Your V2 Preset files are now installed. To change the money management settings while the EA is running live, do this ONLY in the Expert Advisor properties window. Right click on your chart and select Expert Advisor > Properties. The Expert Advisor Properties window will open. Here you can change your lot settings: Minimum Lot, Unit Size, and Cycle Target/Max Lots. The EA will begin using the new settings on the next trade . PLEASE NOTE that "Margin" is the amount of risk capital you are allocating for that particular robot/EA. If you are trading only 1 EA (robot) on your account, then you could allocate the entire balance to that EA. If you are trading 2 EAs on a $1000 account balance, then you would likely allocate about $500 to each EA for balanced diversification, or $333 to 3 different EAs. It's just important that you do not have more than 1 EA sharing the same allocated margin. This is especially important when you are trading at high leverage (or my maximum recommended leverage). Your margin is used by the broker as collateral to cover your losses so it's important that each EA has sufficient margin to cover it's own draw-downs, which may correlate with other EAs that are in a draw-down at the same time. Also note that matching your allocated margin to the lower number in the Preset file name would be trading at my maximum recommended leverage putting typical large cycle draw-downs at 40-50%. Matching your allocated margin to the higher number in the file name would put your leverage at HALF of my recommended maximum leverage with typical cycle draw-downs in the 20-25% range (much safer trading). If that is still too aggressive for you, choose a preset file with a margin range well below what you are actually allocating to that robot. For example, if you have $2000 that you want to trade more conservatively than what the preset files offer, choose a margin range of $700 - $1400. 2. When to Compound Profits? 12. 0.09 WIN, and so on.. Lot sizes for the next trade are determined at the CLOSE of a trade so try to make the lot adjustment BEFORE a trade gets stopped out so the next trade opens at the new Minimum Lot setting. If a new trade opens at your old Minimum Lot setting before you have a chance to compound profits, then it will add/subtract the new unit size onto the Minimum Lot that is open at the time of the change. It's rare to get two winning 7-unit cycles back to back with no losses in between so it's highly likely there will be a loss or two that will reset leverage back to the new minimum lot anyway (when using the Consecutive Wins strategy) and basically correct itself using the new settings. But when using small cycle targets (3 or 4 units) it is likely to get 2 winning cycles back to back without any losses in between so with small cycle targets, it may be best to compound profits immediately after a cycle target is hit (method 2a. above). I encourage you to NOT close trades early. Doing so can cause the EA to jump back into a new trade prematurely at higher leverage even if you closed it at just a few pips of profit. Most of the time, you will do more harm than good by interfering with the trades. The stops and limits work as an important part of the signal strategy and money management strategy, as well. If you do close a trade early, disable Live Trading until the trade's stop or limit would have been hit. Place a horizontal line on your chart where your original stop and limit were and reactivate live trading after one of these prices is hit. This will put the next entry signal on track to where it would be if you had not interfered, but it will require babysitting your charts until price reaches that level so you can reactivate live trading. It's so much easier to just leave it alone. Try to avoid restarting MT4 or altering & compiling your EA source code when there are no open trades. If you do, the EA will lose trade count and default to minimum lot on the next trade. 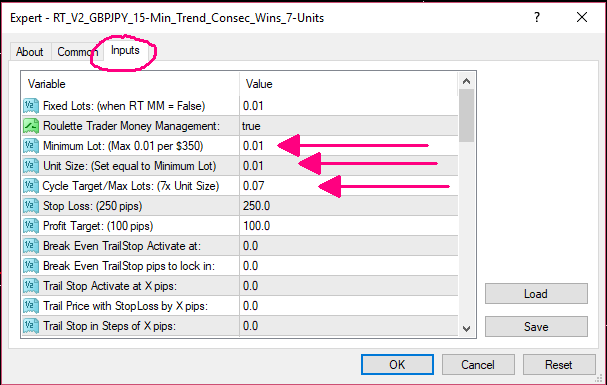 If a trade is open when you restart MT4 or compile the code, then it will continue the money management win and lot count based on the trade that is open at the time of restart or compile and should not effect it. You have a total of 0.05 lots open (0.01 opened by EA + 0.04 opened manually by you). If the trade wins, or appears it is going to win, change your Fixed Lots setting to 0.06. If the trade loses, or appears it is going to lose, change your Fixed Lots setting back to 0.01. This will force the money management to open the correct lot size on the next trade. Once the next trade is opened by the EA at the proper lots, you can reactivate Roulette Trader Money Management (set to True) and the EA will resume the correct lot count from there. Keep in mind that the EA will not acknowledge any trades opened manually by you. It will only add/subtract lots based on trades it opened itself so it's important to get the EA to open the correct size lots itself when it gets off track. I hope this helps you understand how the EAs operate. It took me months and many costly mistakes to figure this all out for myself. Mistakes are usually costly so hopefully this page saves you some time, trouble, and money too. Let me know if you have any questions about any of this.